it's just what you may need to begin your road to recovery. The holidays can be especially hard for individuals that are homeless or in recovery. LCC makes sure the center is open for a few hours to celebrate and provide support. Each year, on Christmas Day the volunteers of Life Connections Center put aside their entire afternoon to provide an incredible day of joy, hope and encouragement. Each year over 350 people come for a full Christmas Dinner, presents and music.We make sure that each person that comes goes home with a gift. It is an amazing afternoon full of holiday cheer. 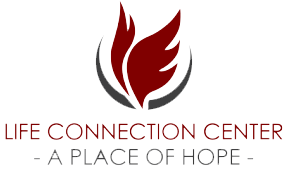 In 2016, Life Connection Center had 350 people join them for Christmas Dinner. If you are interested in donating food or gifts for this event, please contact us. We are also always seeking community volunteers to make this day successful. Thank you for your support. JOIN US IN RELIEVING HUNGER TODAY. In need of help or looking to get involved in some way?